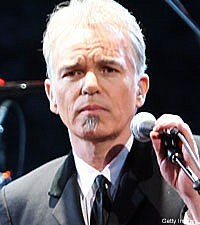 Billy Bob Thornton's behavior at a Canadian radio station has come back to haunt him. The Boxmasters were three songs into their set Thursday when Thornton said to the crowd, "It seems as if when I say something, it's in the news." That drew a shouting of boos from the audience, to which Thornton said, "Boo all you want, but I want to say something ... We're really happy to be here, but I talked to this a--hole yesterday. He and his producers say, 'We promise you we won't say that' [referring to his acting career]. The very first thing they said was that. "I don't really like sensationalism," he continued. "If you look someone in the eyes and promise them something, and you don't do it, you don't get the interview. That's the way it goes." The audience apparently didn't like Thornton's explanation of his behavior. They met that statement with more boos and cries of "Here comes the gravy," a reference to Thornton's description, in the same CBC interview, of Canadian audiences being like "mashed potatoes with no gravy." Thornton was on the defense about that analogy, as well. "I was talking about the guy who was interviewing me," he told the Toronto Star, adding that he "loves Canada." The Boxmasters were on tour with Willie Nelson (someone Thornton claimed in the CBC interview to have "never really met") and Ray Price. But as of Friday, they are no longer on the bill. A statement on Willie's official website reads, "It has been reported that Billy Bob Thornton & The Boxmasters will not be continuing the Canadian tour with Willie and Ray. At this time, no reasons have been announced but the remainder of the tour will continue as scheduled without The Boxmasters."